#On 2nd day of Navratri , Maa Durga is worshipped as MAA BRAHMACHARINI, the source of ultimate knowledge and wisdom. Maa Brahmacharini is a symbol of love and loyalty. She is unmarried form of Goddess Parvati. 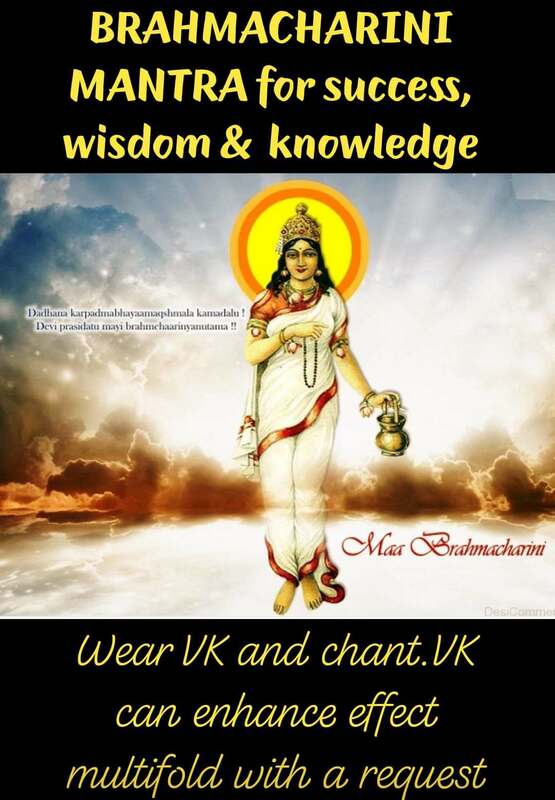 Brahmacharini signifies ‘Brahma’ (penance) and “Charini” (female follower/ devotee) , she performs Tapa or hard penance to obtain Lord Shiva as her Divine consort. Maa Brahmacharini , inspires to hold on to ethics while we perform our duties. Gratitude to Maa Brahmacharini for blessings to get rid of selfishness , ego, greed and laziness. She blesses emotional strength , mental balance and confidence even in the darkest hour. Devi Brahmacharini showers blessings of peace and prosperity on all her devotees. Chanting of this mantra helps to receive her blessings for success, wisdom and knowledge. It bestows the chanter the beauty and kindness of the soul and the body. If you love to chant mantras, you can chant this mantra while wearing VK and request VK to enhance its effects multifold to you. You can also take its energy by direct request or in drinking water by Title of this mantra as VK can mimick Mantras just with the title of the Mantra. Gratitude to infinite blessings showered by Maa Durga in our lives. Wow Thankyou for this amazing tip didi. This image is so beautiful..
May the divine energy of maa Durga bless all. Gratitudes to @SharatSir ji for VK can mimick Mantra energy in Navratri.